While most puppy owners would love nothing more than to spend every moment with their new canine companion, it's not always possible. There's going to a time when you must leave your new pup behind. It can be very daunting to leave a young puppy alone for the first time. From a human standpoint, there's a lot of unknowns to worry about. A puppy is like a child in the sense that they don't really know what's right or what's wrong. They don't know how to behave by themselves just yet. Most of their life has been spent with other dogs and humans. Canines are social creatures. They thrive when they're a part of a pack. When that pack is suddenly gone, most young dogs don't even know what to do with themselves. They quickly start to develop feelings of anxiety and stress. Unfortunately, this can lead to a lot of behavioral problems that you're not there to deal with. 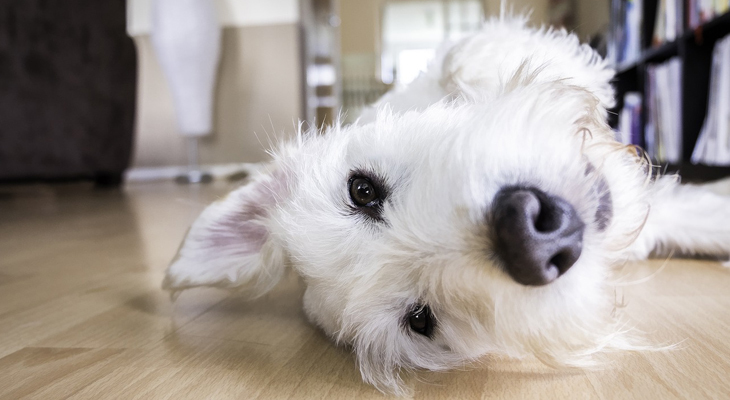 If your furry friend isn't completely housebroken yet, you may also have to worry about accidents and messes. Despite all the unknowns, it's important that you take that first step. Your puppy has to learn to be independent. Those first few hours by themselves is going to be a learning experience for both of you. Luckily, there are some things you can do to make the experience less stressful for both you and your puppy. Here are some tips that can help prevent issues when you leave your pup alone. Before you even consider leaving your puppy alone, you need to make sure that they're ready. It's important that you don't take the next step too soon. The worst thing you can do is to leave your puppy alone within the first few days of bringing them home. They're in a completely new environment and have hardly had any time to get comfortable with their surroundings. You need to commit a few days to bond with your puppy. Take that time to show them around the house. Bring them in every room and let them explore freely. If your pooch is still afraid of certain rooms, they're not going to handle solitude very well. Wait until your pup has no problem running around your house. By that point, they probably already have a favorite spot they can go to when things get scary. While it may be difficult, you need to avoid those puppy-dog eyes every once in a while. Showering your dog with affection around the clock will only create issues once you leave. It's a good idea to establish some alone time. You don't have to make it a serious thing. Something as simple as ignoring them while you're watching television or eating is enough. When you do this, you're teaching your dog to get comfortable by themselves. You're showing them that it's alright that you're not paying attention to them. They may cry or whine at first, but it's something that they need to learn. If they handle this well, you can try to set up some time where they can stay in a room or crate by themselves. Take small steps to work up your dog's confidence. Puppies are little balls of energy that can keep going all day long if you let them. It's a good idea to teach your dog how to calm down early on in the training process. You can do this by abruptly stopping a play session every once in a while. Use a training word, such as, "Hush," or "Calm." When you say this command, have your puppy sit still for a few minutes. You can then end the calm period with another command. While it may seem simple, teaching your dog how to calm down will show them that it's not the end of the world to sit still for a bit. Coddling your puppy can have a pretty serious effect on their attitude towards being alone. You should never apologize to them or talk about leaving in a sad voice. This can make them start to think that your absence is a bad thing. *You want your pup to get comfortable without you, so avoid babying them after you return. 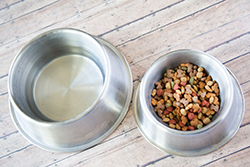 Before you leave, you need to make sure that all of your dog's basic needs are being met. Fill up their water bowl so that they can stay hydrated while you're gone. You should also consider their dietary needs. At this point, you should already have some kind of feeding schedule established. If you don't, consult with your vet. It's crucial that you stick to a feeding schedule before you start leaving your dog alone. While some owners prefer to free-feed their young pups, it's not recommended. Puppies are voracious eaters who will consume beyond their needs. Eating is also very comfortable for them. If they have a constant supply of food at their disposal when you're gone, they may end up eating way too much kibble. This can ultimately lead to weight gain and a slew of health issues. If you're planning on leaving your pup home alone for the first time, make sure that it's not during a time when they typically eat. A great dog bed will be your pup's safe haven. They spend a lot of time sleeping, so their beds naturally become familiar over time. You need to choose a high-quality bed before you even bring your pup home. Give them plenty of time to get used to the bed before you leave them alone. When start feeling anxious, their bed is going to be there for some comfort. Some slightly worn clothing is a great way to help your pup feel comfortable during your absence. Canines rely heavily on their sense of smell. Their olfactory senses are much more powerful than ours. Your scent is like a distinct signature for your dog. They can smell you before you enter a room, even if you feel like you don't smell like anything at all. Even if you're not there, the familiar scent from your clothes will make your dog feel like you are. So, take an article of clothing out of your hamper. You can leave it in your pup's bed or in an area that you frequent when you are at home. Make sure that it's somewhere your dog can access. Chew toys are a great way to keep your dog occupied. They're very enticing, especially to young pups. Give your dog some chew toys while you're gone. While your pooch may not use it the entire time you're away, it may be enough to distract them for a bit. They might not even realize that you're gone at first. Not all puppies know how to use a chew toy right away. To ensure that your dog knows how to have fun, you can play with one while you're at home. Get them comfortable chewing on it before you leave. In addition to leaving your precious pup with plenty of toys to play with while you're away, you can also invest in products that expand your dog's mind. Mental stimulation toys are great for battling separation anxiety and boredom. These products come in a wide variety of designs. Many of them incorporate hidden treats inside. To get the reward, your pup has to solve the puzzle. Dogs can spend hours having fun with these accessories. While some dogs can get bored with chew toys after a few minutes, mental stimulation toys have the added incentive of treats. Your dog can have fun and improve their problem-solving skills. All without even realizing you're out of the house. Crate training is the preferred housetraining method for many dog owners. If you're already using a crate as part of your pup's training, why not use it when you're out of the house? You can create a comfortable space inside the crate that your dog will enjoy. While they may still experience many emotions while you're gone, the crate will help them feel safe. Furthermore, a crate can prevent your dog from wreaking havoc on your home. Any mess they make will be contained inside the crate instead of scattered around your house. If you don't want to use a crate, you can still keep your dog contained to one area. A dog gate can be used to create a physical barrier. Whether you decide to keep your pup in one room or you simply want to prevent them from going up the stairs, a gate is an effective tool. Another option is to use a playpen. Essentially, they're small indoor fences that prevent your dog from exploring your home. The great thing about playpens is that they offer a bit more freedom than crates. Your pup will be able to walk around and play, albeit in a contained area. Pee pads are a must-have if you plan on leaving your puppy alone for more than an hour. Young dogs have notoriously small bladders. Most puppies need to be taken out every hour to avoid accidents in the home. Puppy pee pads can be used to line the crate, room, or pen that your dog will stay in. They'll soak up any messes, making the cleanup process much easier once you return home. 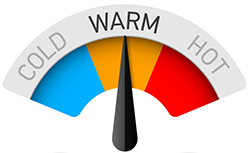 Do you typically turn off the air conditioner when you leave the home? It's important that you keep your house as cozy as possible for your pup. 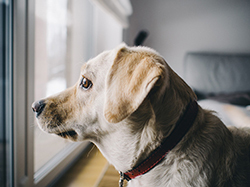 Whether you live in a cold climate or you're dealing with the sweltering heat of summer, your dog is affected by temperature changes just like you are. If you don't want to use your home's climate control system, you need to make sure that your dog can get relief when they need it. To battle cold, provide your pup with plenty of blankets. A heated crate pad is also a great option. During the summer months, a simple tower fan will do the trick. When your dog is comfortable, they're less likely to suffer from stress and anxiety. One thing that many new puppy owners overlook is the safety of their home. Take a look around and you'll quickly realize that your home filled with dangerous items. You should do all that you can to puppy-proof your house before you leave your dog alone. Remove or cover anything that your dog could chew on. This includes power cords, pill bottles, chemical cleaners, and much more. To ensure that your dog doesn't accidentally ingest something that's toxic to them, invest in a dog-proof trash can that's completely secure. Sometimes, trickery is all it takes to make your dog feel secure. If your home is obviously empty, your dog will instantly realize that you're not there. There's a lot you can do to make it appear as if you are. You can keep a light on or let the television play. If your dog is confined to a crate, room, or playpen, they may just assume that they can't see you. This technique is particularly effective if your dog is used to spending some time during the day alone. When your puppy is all alone, the simplest sounds could trigger fear and stress. Outdoor noise should be blocked out as much as possible. Some examples of triggering outdoor noise would include people talking, car horns, other dogs barking, and much more. To ensure that these sounds don't affect your dog, make sure to close all of the windows. You can also turn some things on to drown out any noise pollution. Oftentimes, something as simple as a ceiling fan is enough. Alternatively, you can turn on your television to a nature program. There are also many videos that loop nature sounds. Nature sounds are familiar enough to provide some comfort, but not extreme enough to cause an unwanted reaction. Despite your pup's playful attitude, they can get tuckered out pretty easily. Before you leave, give your dog the opportunity to get plenty of exercise. Have them run around the yard for a bit. Not only will this help them release some pent-up energy, but it can also prepare them for a nice nap. If your dog is exhausted, they're not as likely to cause destruction. Instead, they'll quickly fall asleep until you get home. One of the biggest mistakes you can make is to forget to let your dog out. As mentioned earlier, puppies can't hold it in for very long. That's something that they have to learn. Let your dog out to do their business. Give them the opportunity to use the bathroom so that they don't have the urge to do so while you're gone. You should treat your departure and arrival as nothing special. It can be tempting to immediately pet your dog when you get home or go through a drawn-out goodbye when you leave. However, doing so can create extreme separation anxiety in the future. By making a big spectacle about leaving your dog alone, you're automatically associating the act with negative feelings. When you leave, do so quietly. Don't say goodbye. Just put your puppy where they need to be and walk out the door. Upon your return, ignore your dog until he or she calms down. If they're whining, barking, or fawning for your attention, you shouldn't acknowledge it at all. You want your pup to remain calm. That shows that they're comfortable enough to be alone. It's perfectly normal to be nervous about leaving your puppy alone for the first time. To get a better idea about how your dog will react, you can perform a few trial runs before you actually leave. Step outside your front door for a moment and see if you can hear whining. Alternatively, you can employ the help of friends and family. Having someone else watch your dog while you're gone is a great way to get your dog used to not seeing you around. During this test run, do everything you plan on doing during the real thing. Leave your pup in their designated spot and instruct your dog sitter to not interact with them unless it's completely necessary. This tip can provide you with some peace of mind. There are many dog-specific monitoring products available. Many of them connect to your wireless network so that you can see how your dog is doing while you're out. There are even some cameras that feature two-way communication functions and treat dispensers. Monitoring equipment can provide a lot of different benefits. You'll be able to enjoy your time out knowing that your pup is safe. If you have a device that lets you communicate with your puppy, they'll get some comfort from hearing your voice, even if it's only for a minute. Each time you leave the house, your dog is learning how to cope. They're getting more familiar with spending time alone and how to behave when you're not around. You should treat the time you spend away from your dog as a training session. If your dog does all the right things, reward them for their efforts. That positive reinforcement can go a long way. Eventually, your young puppy will grow up to be a happy and independent adult who can handle anything. Leaving your puppy alone for the first time is a big leap of faith. It involves a lot of risks. In most cases, your dog isn't going to be perfect the first time. However, you can minimize issues and establish an effective training routine by simply being prepared. Before you know it, you'll be able to leave your pup alone without having to worry about a thing.